If you enjoy eating like a king and happen to have more money than sense, this new takeaway has been made for you. 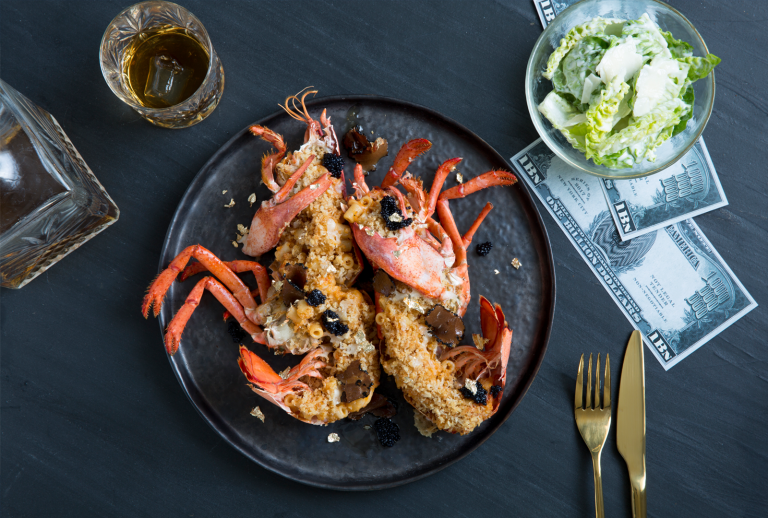 Inspired by the Sky Atlantic series Billions, the chefs at London pop-up The Drama Kitchen have created one of the world's most expensive home delivery meals, with a price tag of £950. It's not exactly bargain, but the 'Billionaire' is a definite upgrade from eating soggy pizza out the box. The dish is based on mac 'n' cheese, but it comes with a few fancy extras. These include premium Scottish lobsters delivered to order from Billingsate Market, 24 month-aged Parmigianino Reggiano, caviar, black truffle, 23 carat gold lead (because, why not?) and to wash it all down, a glass of Kavalan Solist Vinho Barrique Whiskey, which was drunk by Chuck Roads in the TV show. To top things off, Deliveroo will ship it to your door on a bed of billion-dollar notes by a private waiter. Sounds extravagant, but for those sensible people who aren't willing to splash out almost a grand on a silver platter, The Drama Kitchen also does a regular mac 'n' cheese option. From Thursday 26 to Sunday 29 January, the pop-up will also be serving up takeaways inspired by other popular shows, including Game of Thrones, Fortitude and Twin Peaks. They sound more affordable already.